This Christmas I’m celebrating it in the Exotic Tropical Island of Bali… yes the Bali where Julia Roberts finds inner peace and balance of love in the movie Eat, Pray and Love. Spending this holiday season with my eldest son, his wife and her parents. The #124th theme Christmas for FoodieMonday/ Bloghop group has come just at the right time. Last week before traveling I baked an Easy Christmas Cake and some Cookies. So for this post was contemplating whether I should post the cake first or the cookies. The cake won and the cookies will be posted a bit later. The last time we spent Christmas with my daughter in law and her parents was in Dubai. Family time together is fun and makes any festival more meaningful. My family is spread all over the world and for us to get together as one becomes very difficult because of jobs and number of days they can take off. For quite a while we were planning that the whole family gets together in Bali for Christmas. However, that has not been possible, my other son, my daughter and son in law cannot make it to Bali. On the other side, my daughter in law’s brother can’t make it. However, there is always hope that one day we will be able to take a holiday together. However, as I am writing this post, I am excited to visit a new place and really looking forward to spending 2 whole weeks with the rest of the family. I was supposed to make the proper Christmas Cake but I didn’t soak the fruits in time… so perhaps next year! However, there are Christmas Cakes that are made without soaking the fruit. That’s why the recipe I’m about to share is so easy, fuss free. The types of dried fruits you use is up to you. I used what my daughter had in her pantry. I was so tempted to buy the dried kiwi, strawberries, pineapple, etc but had to really control myself. I had to clear her pantry as come Feb she is moving to Dubai. So lets get right to the cake without much delay. By the way, I hadn’t baked a proper cake for a very long time and when I did, I baked two within a span of nearly 2 weeks. I bake muffins but that’s not a true cake. The other cake recipe will hopefully follow. Prepare the baking tin. For one cake you can use a 9″ round tin. I used a 6″ round tin and a small loaf tin. Grease the tin lightly with butter. Add about a tsp or so of flour and shake the tin to spread the flour around. Dust the sides too. Tap the tin gently over the sink to remove excess flour. Sieve the flour, spices and baking powder together. Mix the nuts and dried fruits together. Add 1 tbsp flour to it and mix it. By doing this the fruit and nuts will not sink to the bottom of the cake while baking. Cream butter and sugar together till it is nice and fluffy. The color too will become a bit lighter. Add the zest and one egg. Whisk till the egg is mixed into the sugar butter mixture. Add a tablespoon of flour and mix. Add the second egg and whisk. Add the third egg and whisk. Add the juice and alcohol. Whisk. Add remaining flour and fold well. Add the nuts and fruit mixture and fold it in gently. Transfer the batter to the prepared tin. Baking time will vary according to the size of the tin. 9″ one will take 55-60 minutes. My 6″ one took 45-50 minutes and the small loaf one took 35 minutes. The top should be nice golden brown color and when you insert a toothpick in the middle of the cake it should come out clean if the cake is done. Remove the tin from the oven. Let the cake rest in the tin for 5 minutes. Then remove it carefully and let it cool down completely on a wire rack. 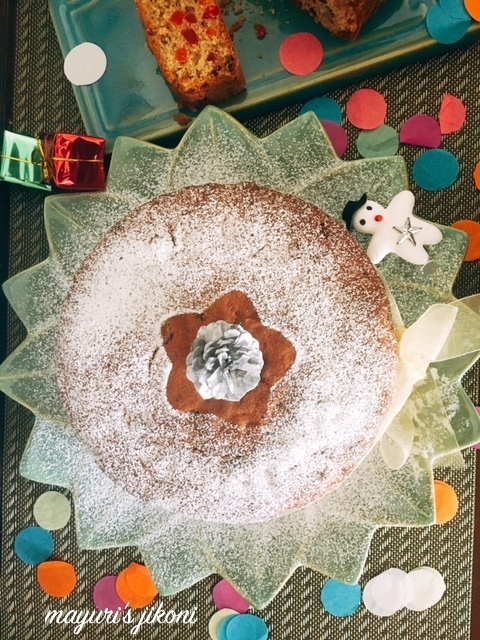 Christmas cake is ready to be enjoyed with friends and family. Use lemon zest instead of orange zest. Replace the alcohol with juice or water. Happy Holidays di…the cake looks yumm ! Lovely and perfect for the holiday season! Yum! Such a simple recipe and such a delightful result! Awesome!! Cake looks inviting.Perfect for this festive season. So divine and perfect for Christmas ! !